Former Prime Minister Najib Razak speaks during a press conference after being granted bail at a court hearing at Kuala Lumpur High Court in Kuala Lumpur, Malaysia, Thursday. Najib pleaded not guilty Thursday to 25 fresh charges of abuse of power and money laundering over the multimillion-dollar looting of a state investment fund. The money-laundering accusations are related to the so-called 1MDB scandal, drawing its name from the 1Malaysia Development Berhad government investment fund. Soon after Najib created the fund in 2009, it amassed billions of dollars in debt. In addition to the money that was directed to Najib's accounts, billions more were siphoned off by other officials and their relatives, according to the U.S. Justice Department, which says at least $2.5 billion was laundered through shell companies – and used to buy luxury items and make investments in the U.S. The DOJ described the purchases in July: "These assets allegedly included high-end real estate and hotel properties in New York and Los Angeles, a $35 million jet aircraft, works of art by Vincent Van Gogh and Claude Monet, an interest in the music publishing rights of EMI Music and the production of the 2013 film The Wolf of Wall Street." Police arrested Najib Wednesday afternoon on the order of the Malaysian Anti-Corruption Commission, which said the charges were related to 2.6 billion ringgit (about $628 million, at today's exchange rate) that was found in the prime minister's bank account. 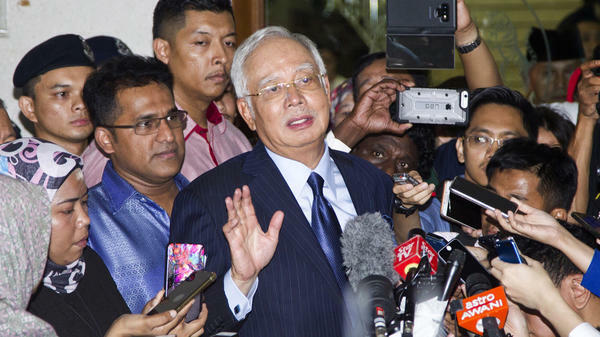 After a court appearance on Thursday, Najib was granted bail. As he left the Kuala Lumpur High Court, he spoke to journalists. "All the charges today will give me a chance to clear my name – that I am not a thief," the former prime minister said, according to The Star. Najib said the facts would show he "returned a large sum of money" right after he lost the national election this past spring. As NPR reported in July, "Even though Najib has denied wrongdoing, the scandal played a role in unseating him as prime minister in May's shock election that also saw the ousting of Malaysia's ruling party of more than 61 years." Najib's upset triggered a rapid response by authorities that were widely reported to have been prevented from acting against the prime minister while he was in charge. Days after the loss, police "carried out a pre-dawn raid at one of his residences, confiscating dozens of suitcases containing cash, jewelry and hundreds of designer bags," as NPR's Scott Neuman reported. Malaysia is currently led by Prime Minister Mahathir Mohamad, the country's previous long-time leader who, now in his 90s, returned to the post after Najib's political party lost power. The U.S. Justice Department is pursuing more than $1 billion in assets related to "an international conspiracy to launder funds misappropriated from" the Malaysian investment fund.